The international style of freeway design makes all the roads in the world look the same but Melbourne’s freeways no longer look like Jeffrey Smart’s modern and utilitarian Cahill Expressway. There are sculptures that can really only be seen from a car in Melbourne – EastLink Freeway has a $5.5 million public art collection. Driving through Melbourne there is DCM’s City Gateway in Flemington with its a reference to the Vault. The big yellow beam at the start of the freeway is better known by other nicknames – “the cheese stick”. DCM is a Melbourne firm specializing in architecture and urban design and their work can be seen all over Melbourne from the new visitors centre at the Shrine of Remembrance to the Web Bridge in Docklands. Noise reduction walls along the freeways have become works of architectural design. Wood Marsh, with Pels Innes and Nielson Kosloff, designed the noise reduction walls along the Eastern Freeway Extension in 1997. Other noise reduction walls designed by architects are the Geelong Road Noise Walls and the Bypass Soundwalls. There is also the Craigieburn Bypass a giant rust-red corten steel arc sweeps across the freeway to create a grand visual gateway into northern Melbourne. This freeway sculpture consists of three long sculptural sound walls punctuated by a pedestrian bridge. Architects Tonkin Zulaikha Greer in collaboration with landscape architecture firm Taylor Cullity Lethlean and artist Robert Owen designed the Craigieburn Bypass. The speed at which the view passes the sculpture was assumed to be walking pace but the modern viewer in a car travels much faster, so the sculptures have to be huge, engaging but not too distracting. I don’t drive a car, I ride a bicycle and the only sculpture that I see from that is Simon Perry’s Rolled Path or the MoreArts exhibition and generally I stop my bike, so I see sculptures at walking pace. Consequently I haven’t actually seen the sculpture along EastLink (can I do it with Google Maps?). 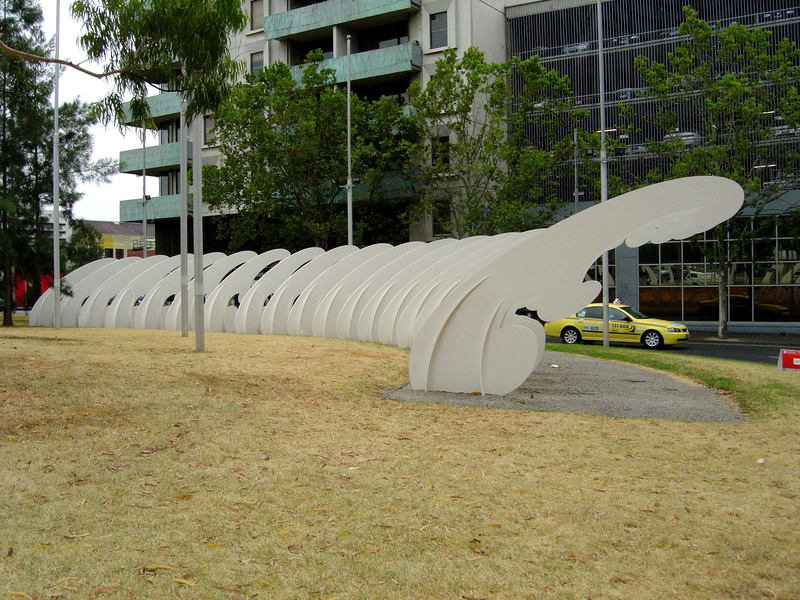 A traffic sculpture that I have seen is in the round about at the corner of Franklin and Queen streets – Island Wave (2003) by Lisa Young. It is a repeating series of white painted steel shapes following the perimeter of the round about. Each of the steel shapes repeats the form of a stylised cross section of a wave about to break. The steel sculpture on concrete footing was fabricated by Gilbro Engineering and installed by Famous Constructions. The linear sculpture parks along EastLink in Melbourne’s outer Eastern suburbs. It features four major works by notable Australian artists. In addition to these major artworks, ConnectEast also funded a collection of smaller scale pieces located along the EastLink Trail for the enjoyment of cyclists and walkers, like me. Elipsoidal Freeway Sculpture by James Angus is between Wellington Rd and Corhanwarrabul Creek. 24 green, blue and white coloured modular ellipsoids of varying sizes cover a distance of 36 metres. Public Art Strategy by Emily Floyd is a giant painted steel blackbird overlooking a yellow worm. It is located between Cheltenham Road and the Dandenong Bypass. The giant children’s toy image is typical of Floyd’s work as an artist, Emily Floyd Signature Work (Rabbit), 2004 a large black painted aluminium toy rabbit on Waterview Walk in the Docklands. At 13 metres high, 19 metres long hers is the smallest of sculptures along the EastLink Trail. Hotel by Callum Morton is between Greens Road and Bangholme road. Callum Morton, an RMIT alumnus, represented Australia at the 2007 Venice Biennale and his art is about architecture (“how space is experienced in built environments”). Hotel is a large-scale model of a bland high-rise modern hotel and some of its windows are lit at night with solar power. Resembling a fallen tree or tower of galvanized steel plate along the side of the motorway. Desiring Machine by Simeon Nelson is next to EastLink south of Thompson Road, near Boundary-Colman’s Road. This is not Nelson’s only sculpture designed for a roadside there is his The M4 Freeway Commission, Sydney 2000. This entry was posted on Wednesday, October 2nd, 2013 at 12:15 PM	and tagged with Callum Morton, Craigieburn Bypass, EastLink, EastLink Freeway, Emily Floyd, Lisa Young, Melbourne and posted in Architecture, Public Sculpture. You can follow any responses to this entry through the RSS 2.0 feed.